Ultra Absorbent, Ultra Affordable Cloth Diapers from Diaper Rite. Available in 4 sizes! The popular Diaper Rite Smart Size Prefold is now available in a super soft premium bamboo fabric. The Diaper Rite Prefold is constructed of 55% rayon from bamboo and 45% organic cotton and is an ultra economic and durable option for your heavy wetter. 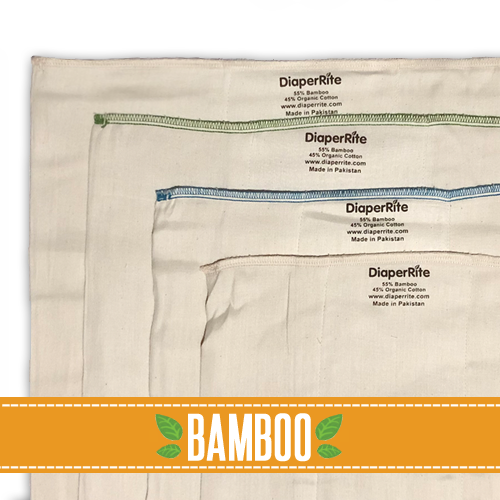 Just like the original cotton Diaper Rite Prefolds, the bamboo prefold is 4x8x4 ply and cut shorter and wider to fit perfectly inside your favorite modern cloth diaper cover. Diaper Rite's tagless prefold design makes them great for those wishing to use a diaper fastener like, snappi, pins or boingos. 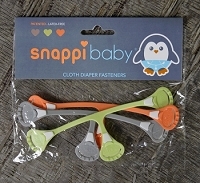 Attach your Snappi or diaper pins wherever you would like--you won't have to worry about a pesky oversized tag to work around! The bamboo plant can absorb three times its weight in water making it an idea option for fiber and textiles. When bamboo is blended with organic cotton, rayon from bamboo creates an ultra absorbent, durable and soft fabric that is perfect for cloth diapering. Rayon from bamboo's super-thirsty nature means it wicks moisture away from the skin more so than other natural fibers, so your baby does not feel quite as wet as with a traditional cotton prefold diaper. Rayon from bamboo is easy to care for, use and is the preferred diapering method for many families who choose cloth. All diapers are 4x8x4 ply. **Prewashed and Washed Bamboo Prefold dimensions above are approximate; taken at rest, but can be pulled wider. After prepping and washing, bamboo prefold diapers will shrink anywhere from 5-15%. Because of the inherent properties of the bamboo and cotton, Prefold Diapers not only shrink differently from batch to batch, but even from diaper to diaper. The measurements provided in the chart above are not exact and cannot be guaranteed; they are intended for approximate size selection only. In addition, avoid washing with the sanitize cycle or in water above 120 degrees as it will not only cause premature wear and tear, but it will also cause them to shrink more than the stated dimensions. Prep Instructions: Wash your Diaper Rite Bamboo Prefolds in hot water with an adequate amount of your preferred detergent. Dry on low to medium heat only until dry. Repeat this process 5 times until quilting begins to appear. Your prefolds will be ready for use at this time, but will become more and more absorbent as they are washed over time. Care Instructions: Store wet or soiled prefold diapers in a dry diaper pail in a well ventilated area. Shake solid waste from the prefold into the toilet before laundering. Rinse prefolds on cold and wash on hot with a detergent. Follow up with an extra rinse. Line dry or machine dry on low to medium heat for best results. Do not over dry. You may find machine drying leaves your diapers feeling softer than line drying. No bleach. No fabric softeners. No diaper rash creams.